I know it's been mentioned before but what the hell was Shane McGowan singing??? Whether Im easy or whether Im true. As I lifted her petticoats easy and slow. A lifetime up my sleeve for a bottle her show. I loved the song So great seeing u2 and others. Andrea corr looked beautiful. In This article said Bob geldof was going to be there in the video i didn't see him. Heres the article not sure if its been posted. THE cream of Irish rock, pop and folk music have come together to record a tribute to legendary singer Ronnie Drew, who has been battling cancer for over a year. U2, Andrea Corr, Christy Moore, Sinead O'Connor, Shane MacGowan and Ronan Keating are just a few of the big names on the brand new song, 'The Ballad Of Ronnie Drew'. It was recorded in Windmill Lane Studios in Dublin over the last couple of days and Bono said he hopes the song will show Ronnie how much he is "loved and respected." But Ronnie has yet to hear the number, as he is recuperating at home after his latest bout of treatment. Members of U2 and Kila were among those who streamed into the studio over the two days of recording. Other stars included Bob Geldof, Damien Dempsey, Gavin Friday, Jerry Fish, Paul Brady, Paddy Casey, Mick Pyro (of Republic of Loose), Mundy, Chris de Burgh, Eleanor Shanley and Mary Coughlan, as well as members of The Dubliners and The Chieftains. And Frames singer Glen Hansard recorded his vocals on a telephone line from the Czech Republic, where he now lives. It was produced by Sinead O'Connor's former husband John Reynolds, and the session was filmed by John Carney, the director of the acclaimed Irish movie 'Once'. The song is a collaboration, written by the Grateful Dead lyricist Robert Hunter, with Bono, the Edge and the former Golden Horde singer and songwriter Simon Carmody. 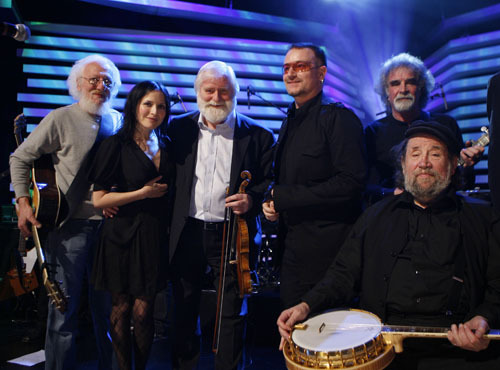 Bono revealed: "Simon seemed to think that Robert Hunter was a big fan of Ronnie and suggested that we get Robert involved in writing the song. So we contacted him. "But to be honest, I can't really remember how it all happened. "There was some vino involved, it has to be said. But I remember myself and Simon were waxing lyrical about the great man. "The idea was that we would all try to write a song for Ronnie to sing, but then it changed to writing a song about Ronnie himself." Simon Carmody added: "Myself and Bono were out having a meal and a bottle of wine and just talking, and Bono suggested we do a song for Ronnie. Bono has a whim of iron. When he gets an idea, he delivers. It's been incredible, the way it's taken shape." Hunter's lyrics provided the launching pad and the song was completed and demo-ed by members of U2, with Bono singing and Edge playing a tres, a Cuban instrument given to him as a Christmas present by his wife Morleigh, to achieve the appropriate folk flavour. Ronnie is still battling with cancer, which was the inspiration for -- and inevitably gives added urgency to -- what is a history-making project. "When you're fighting cancer your mood is critical. We want Ronnie to know how much he is really respected and loved," stated Bono. "This is a big fight for him. But he will win it. But like any fighter, it's easier if there's a crowd cheering. Ronnie is like the King of Ireland, and we are his subjects." Ronnie spent all of last year undergoing treatment, with his beloved wife Deirdre then tragically succumbing to the same disease and passing away during that time. 'Hot Press' editor Niall Stokes, who was at the session, recalled: "As the night turned into morning on the second day of recording, producer John Reynolds laid down a couple of mixes for the remainder of the gathering to listen to. Bono, Andrea Corr, Moya Brennan and Simon Carmody then all suggested modifications and changes." 'The Ballad of Ronnie Drew' is now set to be released -- upon Ronnie's approval -- as a tribute to the legendary performer who first became famous with The Dubliners, and was the singer on their 1960s chart hit 'Seven Drunken Nights', among other classic recordings. Stokes, who has now heard the finished version, added: "It is an astonishing record. The song is powerful and poetic, with a number of brilliantly crafted standout lines. 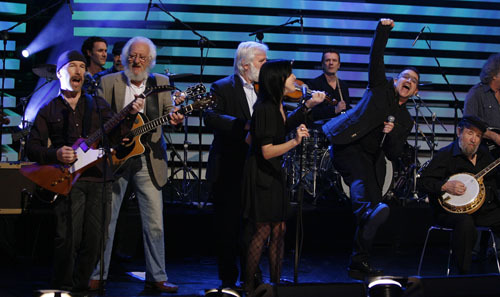 But with Bono, Shane McGowan, Christy Moore and Damien Dempsey all taking verses, the performances are amazing. And Sinead, Andrea and Moya are wonderful on the chorus. It's a certain Number 1." "It was a real privilege to be part of it," said Clannad singer Moya Brennan. "The atmosphere in the room was just amazing." And Andrea Corr was equally enthusiastic. "I didn't want to go home. It is such an amazingly beautiful song and such a wonderful idea. It is the kind of occasion that you'll remember all your life. It was lovely to have been part of it." The song was intended as a surprise for Ronnie. But, fearful that word of the recording session would slip out, his son Phelim let him know what was going on. "I believe he's just finished his current course of treatment and is in great form. But he definitely hasn't heard the song yet," his agent Brian Hand said. Some of the main people involved in the session planning to bring the finished version to Ronnie at his home in Greystones over the weekend. Is the single only available to buy in Ireland or can we get it off of iTunes? 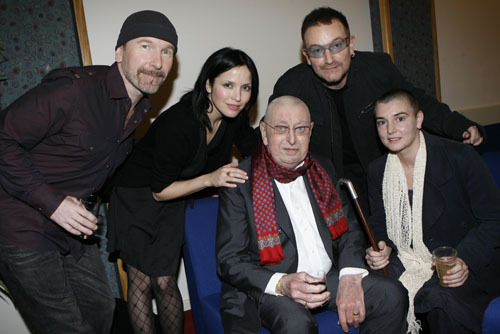 Just saw this on Myspace, Bono sounds wonderful, lovely to see the guys performing together, and even Sinéad was there!?! Bono emerges from the 'Town Bar & Grill' restaurant at 5am looking a little unsteady on his feet and heads for his waiting Maserati sports car. The singer was at an afterparty for The Late Late show which apparently erupted into a traditional Irish sing-song, Dublin, Ireland - 23.02.08. When are they going to write a tribute song to raise money to put poor Shane McGowan out of his misery? Oh no, don't tell me Bono is drinking and driving! I agree. I hope he is not too. Bono = and lovely shadess. And was Larry smiling lol they all looked like they were gaving a great time! Thanks guys for posting the link and pictures! Bonos looking way too awesome and sounds incredible. That performance was awesome! Bono seemed energetic and thriving, as did Edge and Adam. Shockingly, Larry seemed happy to be where he was and looked like he was not in pain. Yay! All these recent events have made me soooooooo excited for what is to come from my favorite band in the entire world! Thank you for posting the YouTube link!